Success! The Universe has lit a fire within you which is not to go out any time soon. Your creativity is heightened now, and the passion to effect momentous changes in your life fills your very soul. 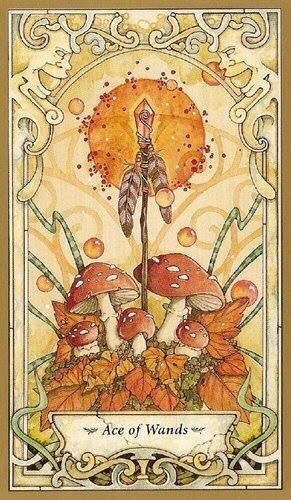 I noticed something as I sat down to write this, and that is that the Featured Card of the Day for the 28th of November is also the Ace of Wands! A double dose of a very powerful energy is available to you right now. Make positive use of any and all opportunities which the Universe may put before you today, for in the next five days, on the 3rd, Mercury will begin its retrograde. You will be happier with yourself if you accomplish more this week. Whatever Divine Intervention is coming your way, I do not feel it is just plopped in your lap; it is likely you have been putting forth a great deal of effort to make things happen. And, now they are, and there is some form of new beginning taking place in your life, and the Universe is jumping to light the fire for your change. This is a great day to find solutions, at long last, and to make things happen in your favor. Remember, you are only at the beginning of something very special. This entry was posted in Card of the Day, General Tarot, Love and Finance, Patreon, Readings, YouTube Videos and tagged Ace of Wands, Card of the Day, Guidance, Path, Reading, Tarot.